Debt ceiling talks turn to taxes - higher taxes! 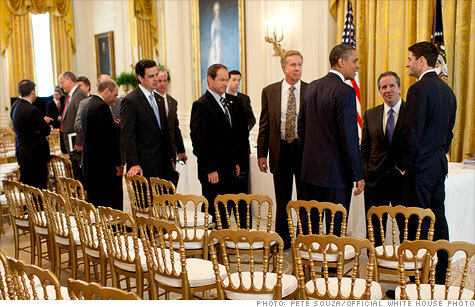 President Obama meets with House Republicans earlier this month at the White House. NEW YORK (CNNMoney) -- Any deal to raise the debt ceiling will have to include steep cuts to federal spending. But might it also include tax hikes? Not if Republicans have anything to say about it. GOP negotiators pulled the plug on talks late last week after Democrats proposed closing loopholes in the tax code and eliminating subsidies. The measures would result in more revenue flowing into federal coffers. They also amount to a tax hike. The dispute has brought out Washington's big guns. President Obama has replaced Vice President Joe Biden as the principal Democratic negotiator, and Mitch McConnell, the top Senate Republican, is entering the fray. If you listen to McConnell, it doesn't sound like the White House proposals will fly. "Throwing more tax revenue into the mix is simply not going to produce a desirable result, and it won't pass," McConnell said on Sunday. But what exactly are Republicans objecting to? The White House wants to close loopholes that benefit the owners of private jets, and raise taxes on hedge fund managers who benefit from paying lower tax rates on so-called "carried interest." Additional proposals would change how business inventory is taxed, and eliminate government subsidies for oil and gas companies. There is a common theme. The proposals spare the middle class and instead focus on corporations and the wealthy. The White House says they focus on "unnecessary" and "unjustifiable" tax breaks. Total savings are estimated at $100 billion to $150 billion. "It's a trivial amount of money," said Howard Gleckman, resident fellow at the Tax Policy Center. "It's loose change in the sofa." However, one additional proposal pushed by Democrats could add up to real money. The White House wants to limit tax deductions taken by the wealthiest Americans. Households earning more than $500,000 a year would have their deductions capped at 10% of adjusted gross income, according to reports. Depending on the details, that could quickly add up to increased revenue in the hundreds of billions. "There is a lot of money there," Gleckman said. "It is a significant tax increase on high income people." Economists generally consider a limit on deductions a more efficient way to raise revenue than simply hiking the tax rate. For Republicans, voting for any of these measures would violate the anti-tax hike pledge pushed by Grover Norquist of Americans for Tax Reform, who counts hundreds of lawmakers as signatories to his pledge. "Grover will lose his mind over this," Gleckman said. In other words: It's a very risky political move. However, there are some signs of a thaw. The Senate, with a significant amount of Republican support, voted earlier this month to eliminate billions of dollars in subsidies for the ethanol industry in the name of deficit reduction. While that bill is not expected to pass the president's desk in its current form, its passage marked a reversal from an entrenched position. Still, absent a significant market reaction as the Aug. 2 deadline approaches, Gleckman said it's unlikely that any of the White House revenue proposals will make it into a deal. But at some point, the chickens will come home to roost. Budget experts are near unanimous in saying that a credible debt-reduction plan requires additional revenue.